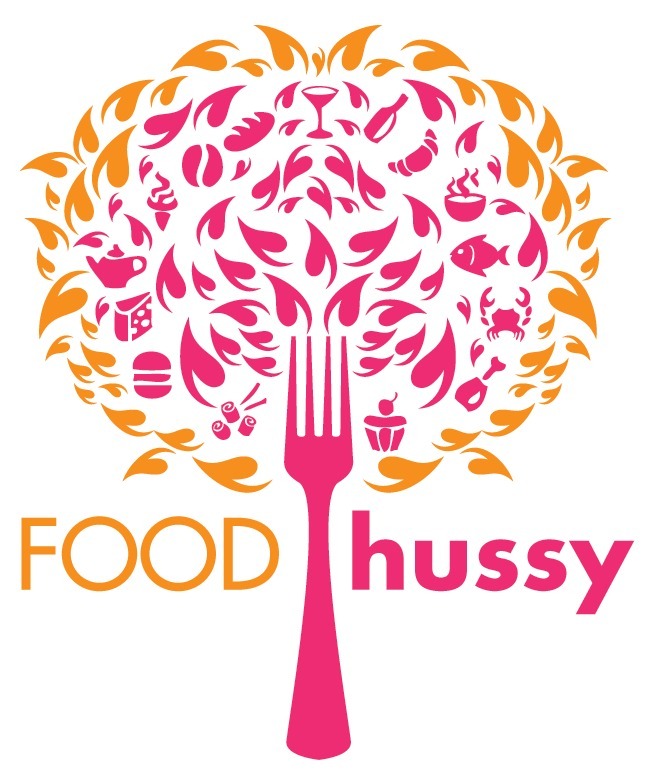 Recipe: (Keto) Garlic Butter Pork Chops | The Food Hussy! Recently I was out of town and my dog sitter was here and had some ingredients from one of those meal-delivery companies in the fridge that she forgot to take with her. She told me to just keep them and enjoy. But I had no instructions - just a bag of ingredients - so let's figure it out!!! 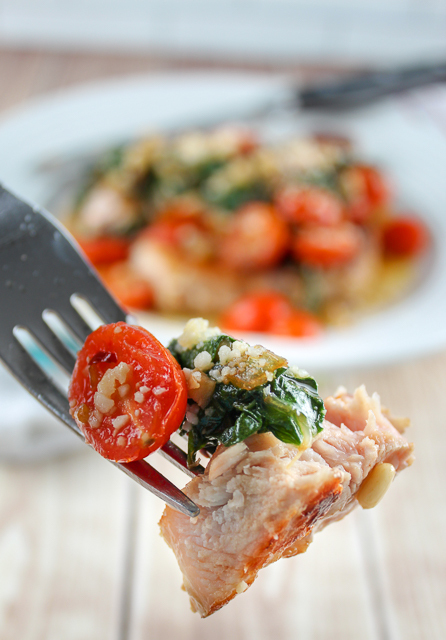 I had pork chops, Swiss chard, grape tomatoes, garlic, butter, pine nuts and Parmesan cheese. So what should I make - I just thought well - let's put it all together and figure it out. I was hungry and didn't want to monkey around for a long time either - so here we go! I seared the chop first and then added in the garlic, butter and shallot - getting those flavors in right off the bat - giving them time to dig into the pork chop like I was going to. Then you finish with the chard and tomatoes - they just need a couple of minutes to soften. If you don't have - or are afraid of Swiss chard (haha) - you can use spinach or kale too. I like Swiss chard though - you just tear the leaves off the tough stem and add them in. Spinach wilts really quickly and almost disintegrates - whereas chard holds up a little more. 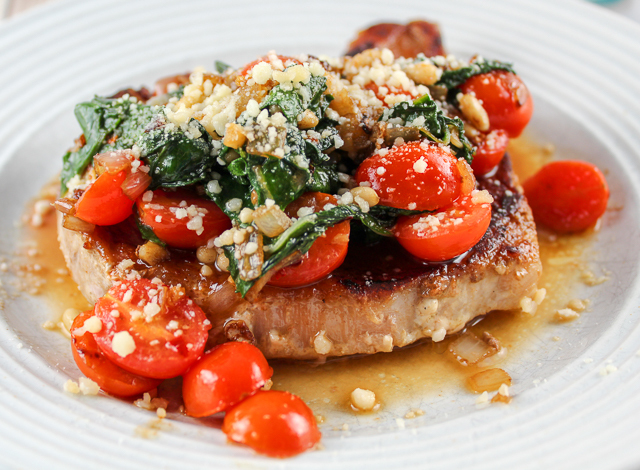 This pork chop came out extremely juicy and delicious - and you'll notice that PERFECT blush of pink! I'm pretty good with cooking pork but I still always grab the thermometer and temp it to 145. I'll actually take it off at 140 - because it will continue to cook a bit. 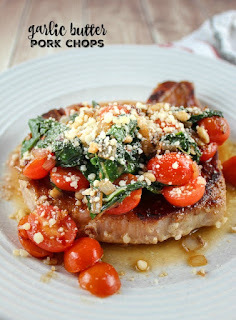 Pork chops are one of my favorites - the bone-in chops are so juicy and flavorful! Then add garlic butter and some veggies - it's a perfect keto-friendly meal! SO easy & delicious! Can't wait to try!